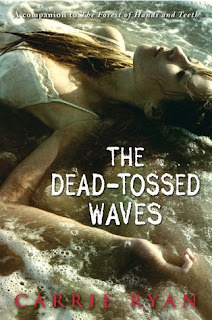 THE DEAD-TOSSED WAVES has the feel of a dirge, beautifully poetic, but so relentlessly depressing, it’s draining. This is a dead world where the masses of infected “zombies” vastly outnumber the few pockets of humans still fighting against the tide. It’s a world where one slip-up means infection, isolation, or death. At the center of all this is Gabry, a sheltered, timid teen who is thrust into the fray after heeding the call of her raging hormones. After one perfect moment of freedom and bliss with her childhood crush Catcher at the forbidden amusement park outside their beach front settlement of Vista, everything goes wrong in Gabry’s world. Some of her friends are infected and turned, some are captured, and some, like Catcher, have disappeared. And after an act of desperation (and stupidity), Gabry is forced to go on the run (basically a near identical plot structure to book 1, only in reverse, and without as much tension). All of the characters in this installment have ISSUES. There’s Mary (all grown up after her outing in book one THE FORESTS OF HANDS AND TEETH) who still regrets leaving her friends behind. There’s Elias, a mystery teen who hangs out with Soulers (a cult that thinks turning zombie gives you immortality – an interesting thematic aside that could have been expanded) and hides a dark secret. Then there are some other characters with major angst too – but to mention them by name would be too spoilery. “Then what is it?” I need him to give me a reason to keep fighting. To keep pushing forward even though it’s so hard. Even though I’m not sure I still can. “This,” he says, and he presses his lips to mine. I know both Catcher and Elias have their own special, specific reasons for SO DEEPLY LOVING Gabry, but if you take Gabry at face value, she’s no one that objectively should inspire so much devotion. It’s not like I ever rooted for the zombies to go ahead and rip her apart or anything, but I didn’t end the book as a big fan of hers, honestly. But despite a bit of eye-rolling over the overwrought love triangle, I thought there were enough moments of brilliance here to give it 3 Zombie Chickens: Well-worth reading (especially for those who are looking for closure about certain events in THE FOREST OF HANDS AND TEETH). Stopping by from the Boston Bibliophile site! I admit that I'm just starting to get into Young Adult novels (Harry Potter, etc. ), and I now have Hunger Games on my nightstand. This might be one for me to also include as well to read! I really wanted to know more about the world Mary lived in at the end of the first book, but when I found out what this second book was about, I lost all interest in reading it. I totally agree - Gabry was really stupid, but I liked learning more about the world. I wish this book had been about the grown up Mary! I am in complete disagreement here. Mary got on my last flippin' nerves. I contemplated NOT reading the second one because I didn't know if I could deal with Mary again. I much prefer her daughter, Gabry. C&BC - Hunger Games is the bomb! Enjoy! Amanda - Really? I think it's still worth reading. Though you'd probably hate Gabry. S.Krishna - The grown up Mary definitely could have been in it more. But I really didn't understand a lot of her actions and decisions in this one. Christina - I was one of those readers who actually really liked Mary in book one. Gabry, not so much. I had to only skim your review because I am dying to be totally unspoiled for this novel. Your review reminded me to go pick it up! You know, I bought a copy of The Forest of Hands and Teeth for my kids for Easter, and for some reason, nobody can find it now to read it! I think there might be too many books around here! That being said, it sounds like this one was not as good as the first. I still want to read both of them, because I think the premise sounds really interesting. If only I could find the first book! I still can't decide if I'm going to read this series. Maybe I'll wait until they are all out and read them in one big marathon. I need to read these books for my Literary Road Trip through South Carolina - the author is originally from here. That's one of the reasons why I don't like love triangles so much, it always takes away from the plot points I'm more interested in. Plus, I just don't like it when a girl strings two guys along. I still need to get into this series though. I love zombies, so hopefully I'll enjoy my time with it. Great review as always Lenore! I was all ready to jump into this trilogy at some point, after hearing such wonderful things about the first book. Then this one came along. Some loved it. Some dropped the series because of it. Some were so-so. I'm going to wait it out, see if the third one finishes it's business in style, then figure out if I will invest. I am so with you on that kiss! Like you I had issues with Gaby - just as I had issues with Mary and will probably have issues with the MC of Book 3. I love the idea of this world that Ryan has created but the stories are getting formulaic. Despite that though I am curious to see how it all ends up. I can see why some people think Gabry is annoying, but I didn't think she was that bad. I actually saw some character development in her because in the beginning she did not want to leave home at all, but that obviously changed. But I love these books so I'm a little biased. P.S. Who likes the old covers better? I don't mind the The Dead Tossed Waves and The Dark And Hollow Places covers but I cannot stand the new The Forest Of Hands and Teeth one. These books are totally out of my usual comfort zone, but I liked this one better than the first one. I also listened to the audios, which are great! 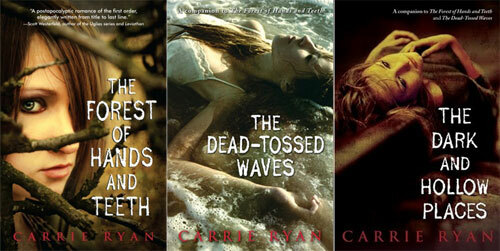 Carrie Ryan is one of my favorite authors. I really love all of her novels. This new book is so good. I am sure that it is going to be a big hit again. Hm, unfortunately, it sounds like Dead-Tossed Waves has some of the aspects that made me dislike the first book. In particular, it sounds like - again - the love triangle dominates the story. I had been contemplating giving this series another go, but I think it's just not for me. I couldn't figure out why these guys were so gaga over Miss Whiney Whinerson either. I didn't find her all that interesting. After posting my review, I'm finding that I'm disliking this book more as time passes. Sandy - I really enjoyed the first novel, and think it can standalone. Megan - Agree on the FOHAT cover. Preferred the first one. I don't mind the new covers on the second 2 books though. Chris - I can understand both guys motivations to a point. Catcher grew up with her, so they have a whole history together we don't see. Elias has the whole Annah excuse, though I DO think that's totally creepy. "an interesting thematic aside that could have been expanded"